Try to "drag" the spinner. Move curser over any image in the spinner, click left mouse button and move it to the left or to the right side. You can also stop the spinner with double-click. Image Encoding: Select whether to encode images or not. 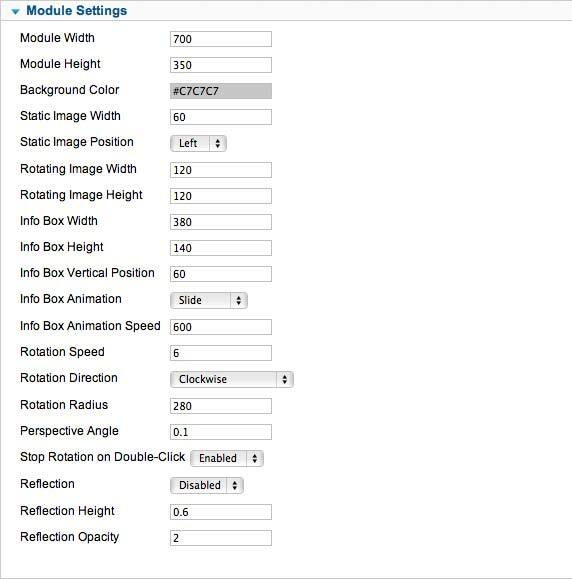 Module Width/Height: Enter module width/height in pixels (in example 960). Images Directory: Path to your folder with images (relative to your Joomla path). This option is not needed in Joomla 1.6, so it's removed in this version. Static Image Width: Enter value in pixels (in example 60). Static Image Position: Select image position left or right. Rotating Image Width/Height: Enter value in pixels (in example 120). Info Box Width/Height: Enter value in pixels (in example 380). Info Box Vertical Position: Enter info box vertical position in percents (in example 60). Value can be from 0 to 100. If you enter 0, the bottom side of the info box will be even with the top side of the module space. If you enter 100, the bottom side of the info box will be even with the bottom side of the module space. Info Box Animation: Select between slide, up-down and fade. Info Box Animation Speed: Enter animation speed in milliseconds (in example 600). Rotation Speed: Enter rotation speed in 1/X radians. Minimum value is 1 (in example 18). Lower value = faster rotation. To decrease rotation speed, enter a higher value. Rotation Direction: Select clockwise or counter-clockwise. Rotation Radius: Enter distance from the center of the circle to the rotating images, in pixels (in example 350). Perspective Angle: Perspective angle value is between 0 and 1. If you set 0, you will see rotation as if you are on the ground level. If you set 1, you will see rotation from the birds eye view. Any decimal value between 0 and 1 is possible, in example 0.1. Stop Rotation on Double-Click: Enable or disable this feature. Reflection: Enable or disable reflection of images. Reflection Height: Enter reflection height (value between 0 and 1): 0 = no reflection, 1 = full height. Reflection Opacity: Enter reflection opacity: minimum value is 1 for no opacity, higher value gives more opacity to the rotating images. You can select font family (all standard web safe fonts included), font size (in pixels), font weight (normal or bold) and font color for heading and text fonts inside the info box. Slot State: Enable slot to show it in module. Static Image: Enter static image name in example image.jpg (for Joomla 1.5), or select file on server (for Joomla 2.5 and later). Rotating Image:Enter static image name in example image.jpg (for Joomla 1.5), or select file on server (for Joomla 2.5 and later). Heading Text: Text that will be displayed as heading of the slot in the info box. Description Text: Text that will be displayed as description of the slot in the info box. 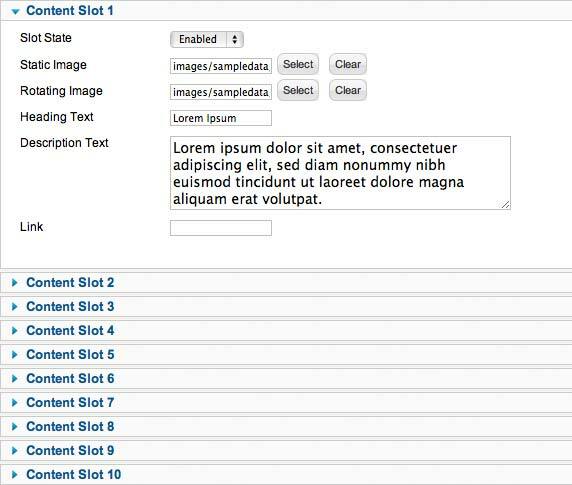 Link: Slot headings and static images can be linked (it's optional for each slot).